Expect sage to feature the best of the web coupons and rebates for green products, product reviews for what we are using around the house, links to items and stories that inspire me, and more. 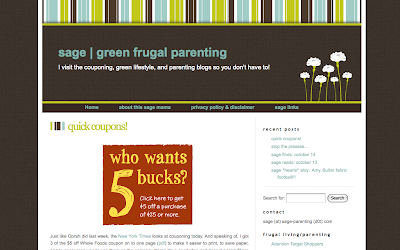 I visit the couponing, discount, grocery store savings, CVS shopping, green lifestyle, and parenting advice blogs so you don’t have to, bringing to sage the best the internet has to offer for natural parenting! (1) I use a ton of links in my posts, rounding up good reads around the green, frugal, and parenting blogospheres. I also have a jumble of links in the sidebar column, and a page dedicated to links. I know it's too much, so I'm thinking of taking everything off the sidebar and instead beefing up the dedicated page. Good idea? Bad idea? Better ideas out there? (2) I have had a number of people email me telling me they like my blog and think it fills an important niche, but that doesn't seem to match my level of readers leaving comments or picking up the feed. What is the disconnect? How can I help people feel connected to what I'm writing so that they participate in the discussion, beyond emailing me privately? (3) I tend to be a little long-winded (see questions above for examples :). Are my posts too wordy? I love how specific these questions are. Readers? What do you think? Want your blog critiqued on BlogCoach? Come on, it won't hurt a bit! I've got some open slots coming up. Just email Angie (address on sidebar).